Precision Medical is based in Northhampton, Pennsylvania. Founded in 1984, Precision Medical, Inc. is a global leader in Respiratory Devices. Manufacturing Oxygen Concentrators, oxygen regulators, aspirators, flowmeters and conservers, Precision Medical is innovative in their approach to solving respiratory problems. The Precision Medical Company provides the same quality of medical oxygen devices commonly found in hospital settings to homecare. Precision Medical Products are designed to be accurate and dependable. Made in the USA, Precision Medical respiratory devices use lightweight and durable materials to make their products easier to use and longer-lasting. Vitality Medical carries the best selling Precision Medical Respiratory Products! What Are Inogen Pulse Dose Portable Oxygen Machines? An Inogen pulse dose oxygen machine is a respiratory system that delivers oxygen according to a user's unique rate of inhalation and individual pace of breath. A pulse dose machine delivers oxygen to the patient every time a breath is taken. When a breath of air is taken, the pressure in the lungs drops. Air begins to flow through the nose and mouth to equalize the pressure, which then travels through the nasal cannula to a pressure sensor in the pulse dose conserving device. A precisely measured dose of oxygen is then delivered via an electronic circuit that opens an electrical valve. After the valve is closed, the sensor waits to detect the next inhalation and starts the process all over again. An Inogen pulse dose machine is contingent upon breathing and inhaling while a continuous flow machine delivers oxygen at a constant rate despite the pace of the user's breathing. An Inogen pulse dose oxygen concentrator is more sophisticated than a continuous flow machine. A "single-solution" Inogen machine can be used while on the go, at home and while sleeping. This type of technology can deliver the proper amount of oxygen during all phases of daily activity and during rest. Inogen pulse dose machines, such as the Inogen G2 and G3, are known for being dependable, quiet, flexible, compact and for having a small battery size. Additionally, many patients using an Inogen pulse dose machine report fewer service issues as well as noticeably quiet motors in comparison to other portable oxygen machines. Both the Inogen One G2 and G3 are available with two different battery options, allowing users to conveniently choose whether they prefer a lighter weight or a longer battery duration. The Inogen One G3 uses pulse oxygen flow and has four separate settings for detection, allowing the user to choose which setting he or she prefers and thus conserving energy usage and time between recharging. 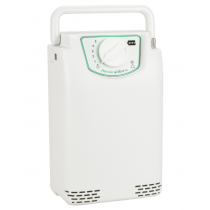 The Inogen One G3 Oxygen Concentrator is suitable for both night and day time use, making it an ideal pulse dose oxygen machine for a variety of different types of lifestyles. The Inogen One G3 is the smallest portable concentrator that provides up to pulse setting 4. Equipped with Intelligent Delivery Technology that is simultaneously lightweight and easy to carry. The small size of this concentrator is easy to handle. Contains an auto power sensing that allows it to be used worldwide.